La Aguera was an administrative district in southern Rio de Oro under Spanish colonial possession from 1920 to 1924. 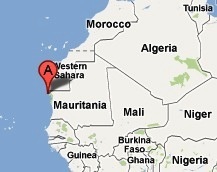 The area is at the southern tip of Western Sahara in the Atlantic coast, south of the Moroccan wall. Spain established an air base on the western side of the peninsula for use as a landing strip for trans-Atlantic flights. As of 2002, the area is almost abandoned and partially overblown with sand – a few fishermen are the only inhabitants. Presently, it is claimed by Morocco although their forces has abandoned it - there is however a guarded Mauritanian military outpost. The first stamps of La Aguera were a set of thirteen stamps issued in June 1920 that were ‘La Aguera’ overprints on issues of the Spanish possession of Rio de Oro. The set (Scott #1 to #13) catalogs for around $250 MNH and around $160 Used. Genuine used examples are hard to find, especially on cover, and they command a huge premium. The lower denominations of the set catalog for around two dollars each while the highest four denominations fetch progressively higher premiums for either Mint or Used. La Aguera issued an original design set of thirteen stamps in June 1922 showing a portrait of King Alfonso XIII. That set (Scott #14 to #26) catalogs for around $125 MNH and around $85 Used. Here again, the lower denominations can be had for just a dollar each while the higher denominations command progressively increasing premiums. The twenty stamps represent the complete stamp issues of La Aguera and as such it should be relatively easy to put together a complete collection of the area. For higher denominations, stamps with some flaws and/or off-centered versions that are affordably priced do come up at auction occasionally.